All in all, it was a very rewarding experience. Germany is such an awesome place. Berlin itself is such an impressive city. There are so many historical sites that are just so interesting to see and visit. 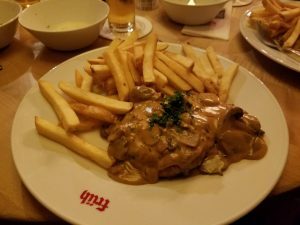 Then there’s also the diversity of cultures in Berlin, which means there are numerous options of cuisines that we can choose (there are several very good Indonesian restaurants too). The public transport system throughout Germany is also very astonishing. The level of efficiency of the public transport puts to shame many systems around the world. Every weekend we also had the opportunity to visit other places in Germany and it is such an awesome experience. 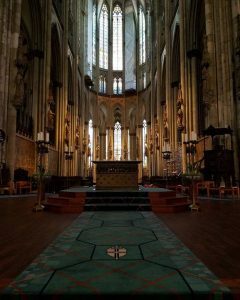 I can honestly say that I’ve lost count on how many historic churches, cathedrals, and castles we have visited because we visited so many of them. In conclusion, our Germany trip is definitely something that all Calvin engineering student should consider because it is just that great. This is a picture of the wine barrel we found in Heidelberg. 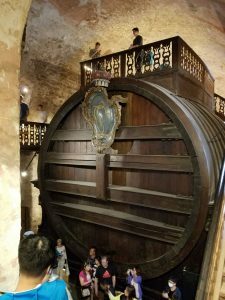 According to Wikipedia this wine barrel can hold up to 219,000 liters of wine. 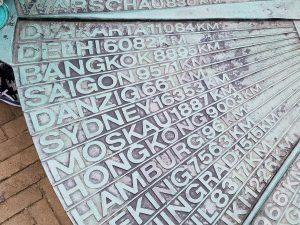 I took this picture of a monument describing the distances of certain cities throughout the world. Djakarta (or Jakarta) is listed to be approximately 11,084 km away. 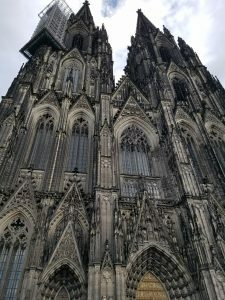 One of our weekend trips’ destination is the city of Köln (Cologne). This city is very famous for its massive Cathedral. As a result, the city is filled with tourists from all over the world (I even met some Indonesians travelling here as well). On Sunday, we attended the mass as a group. It certainly was an interesting experience to me as I have never been in a Catholic high mass before. The mass started with a group of priests carrying the bible and a cross. They also had some incense that had a very interesting smell. To some, the whole mass might seem somewhat ritualistic but in my opinion the things that they did reflect their adoration for God. Even though I didn’t understand anything from the sermon (because it was in German and we had no translation), I thoroughly enjoyed the whole “ritualistic” aspect of it. It makes our adoration for God seem much more real. Being a famous tourist spot meant that the church had many visitors all the time, even some times during the mass. It didn’t really bother me that much because the visitors weren’t being too loud and they were somewhat respectful. However, I believe that it would’ve been so much better if they had translators so that everyone can understand the sermon (considering that most of the people in the mass are tourists anyway). On one of our weekend trips, we visited the Sachenhausen Concentration Camp. It was a very interesting trip as we were able to tour around the restored campgrounds. We were able to read about how the Nazi and the Soviet officers treated their prisoners and how life was for prisoners as well. This trip was very sobering as well. I personally was struck at how people can have so much hatred for others. I understand that wars can be necessary at times and in wars, there are prisoners. What I can’t understand is the underlying hatred that was directed toward these prisoners. They had to endure so much and no shred of humanity was even shown to them. It simply amazes me how someone can have this much hatred towards another that lead them to torturing them this much. Coming to Berlin has definitely opened my eyes to many things about Berlin. Berlin as I knew it is a city that is both historical and technologically advanced. However, when I first arrived in the airport I was a bit disappointed. As an international student in Calvin, I am used to travelling great distances and have been to numerous airports, especially airports in Asia and in my opinion, the Tegel airport is a very bad one. The city itself was, in my opinion, not very impressive. From my perspective, a lot of the infrastructures in Berlin seems very bland and mediocre (save for several historical or very modern buildings). Most buildings are painted with dull colors and it just adds to the mediocrity of city. On top of that there are also no skyscrapers as well. However, what makes Berlin so interesting is the diversity of people and culture. There are just so many cultures in Berlin itself. I’ve seen numerous Turkish, Asian, and Western restaurants and shops just about everywhere. Berlin’s public transport system is also something to be impressed about. The level of punctuality and efficiency is just so astonishingly good. The German public transport system puts to shame many other systems.